The global community has come together to combat these effects of climate change. In 2015, 178 countries signed the Paris Agreement, implementing policies and programs to drastically reduce greenhouse gas emissions. Building on these efforts, the governments of France and Germany jointly created the "Make Our Planet Great Again" program. This program funds innovative climate change research across academic disciplines. Of the 300 applications, one of the 13 grants awarded by the German Academic Exchange Service (DAAD) is one million euros (1.2 million U.S. dollars) to fund a research project proposed by Dr. Christina Richards of the University of South Florida: "Genomics and Epigenomics of Plant Invasion”. The project will use genomics to understand how one of the world’s most invasive species, Japanese knotweed, is able to tolerate diverse environmental challenges. The research will span four years, starting in 2019 and ending in 2022. Dr. Christina Richards, a biologist and professor at the University of South Florida, was selected to work in close collaboration with Professor Oliver Bossdorf of University of Tübingen to establish a research group at the Institute of Evolution & Ecology at the University of Tübingen. Working with Professors Bo Li and Ji Yang of Fudan University in China, the team will characterize the mechanisms of invasion across ecosystems and how invasive species are affected by Earth’s changing climate. Professor Richards' research focuses on plant ecological genomics, ecological and evolutionary epigenetics, plant ecophysiology, conservation genetics, and global change biology. She received her PhD from the University of Georgia in 2004 and worked as a postdoctoral associate at Stony Brook University and New York University. 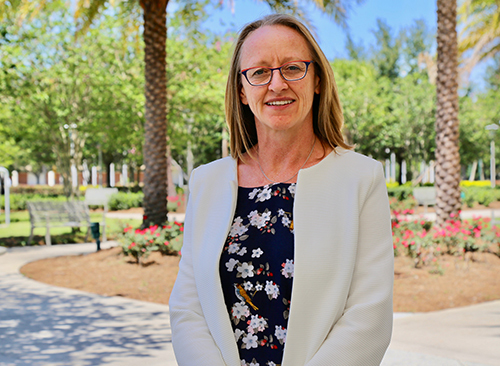 In 2009 she became an assistant professor in the Department of Integrative Biology at the University of South Florida, where she was promoted to Associate Professor in 2016.